Is it possible to like zoodles too much? Like, I just want to eat them all the time. Hot, cold, as a side, as a main, savory, sweet, GIMMIE ALL THE ZOODLES ALL THE TIME. I've been learning just how versatile the zoodle can be. Serve them hot like in my Garlic Chicken Sausage Zoodles OR if its a super hot day like it has been allllll week long here in Pennsylvania, you can also serve them cold! With highs that have been in the 90s and super humid weather I really appreciated the fact that I didn't have to turn on the oven OR a cooktop to make this dinner that was still super hearty and filling. So obviously this dish includes zoodles since I can't stop talking about them, but the rest of the flavors are really what make this dish stand out. There is a chipotle kick from both the greek yogurt dressing the zoodles are tossed in AND the pre-cooked chicken sausage. Now, I'm really not a big fan of spicy food but luckily the creamy sprinkle of goat cheese on top of the dish and the super sweet fresh peach I threw in was enough to cool my tastebuds off from the kick of spice so I could still enjoy this whole plate! Create zucchini noodles or "zoodles" by spiralizing your large zuchinni. I use this kind of spiralizer (affiliate link) and one large zucchini gave me about 310g of zoodles. Toss zoodles with 4 tablespoons of dressing. Cut peach into slices and remove skin. 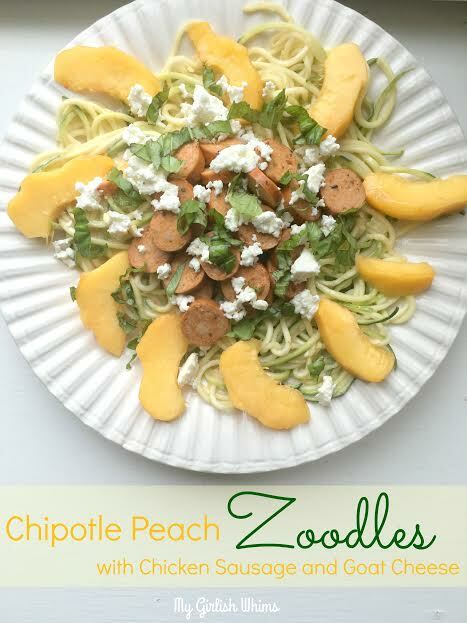 Assemble dish by placing zoodles on a plate and top with sliced chicken sausage, a sprinkle of goat cheese, sliced basil and ring plate with the fresh peach slices. 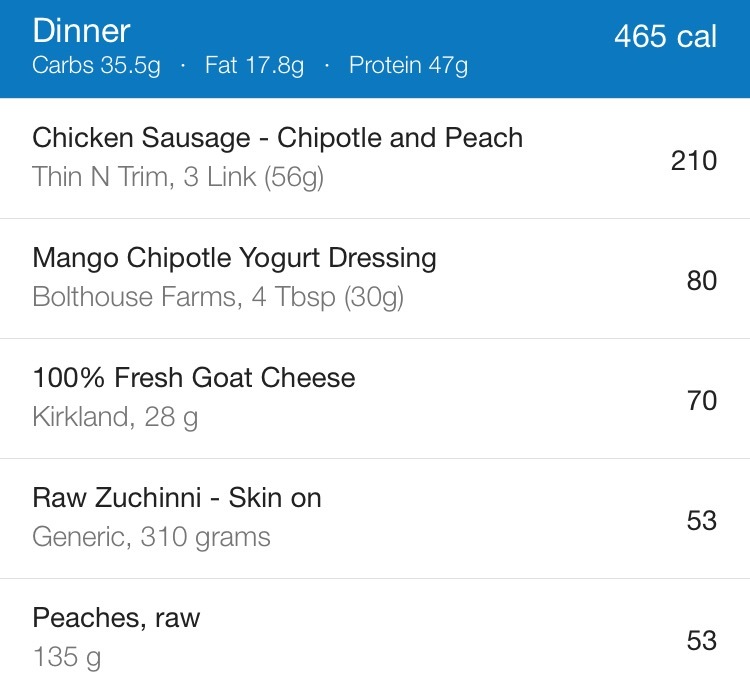 One serving was 465 calories with 36g carbs, 18g fat, and 47g protein.